At James Morton Ties we receive many orders from clubs and businesses for bespoke ties personalised with their colours or logo, but did you know we also offer custom cufflinks? Find out below why we think they would be perfect for your team. 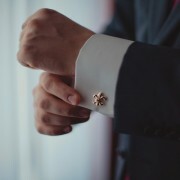 Cufflinks are a great alternative to club ties for a number of reasons. Having matching cufflinks is a more subtle way to match with your colleagues or teammates than having matching ties, but is a great way to make sure everyone in your club or business looks smart. You might even choose to match your cufflinks with custom ties as well, with complementary designs. Cufflinks make an excellent gift for your team to commemorate a special occasion, or as part of a uniform to show off your branding. Whatever reason you choose to order them, we are certain you will be pleased with our bespoke products. We can create completely bespoke cufflinks with your design of choice. If your organisation has a crest or logo we could recreate this in your cufflinks, or if you would prefer a design based around names or initials we can also design this for you. For more abstract designs such as novelty or character cufflinks we are happy to take on the challenge of creating cufflinks to your exact specification. We can create cufflinks in a range of different materials to suit your requirements. For a smart and classic look that will last a lifetime we can create gold plated or silver cufflinks made to your specification, with the option of adding jewel details for a luxurious finishing touch. We also offer cufflinks made from standard gilt or nickel plated, as well as enamel in a wide range of colours. For more information about the kind of cufflinks we can make for you, contact us to get a quote today.